The White House has sought to distance the president from the matter. “Border Coyotes, Drug Dealers and Human Traffickers are treated better,” Trump said in the tweet. Stone was indicted Friday on seven counts, including one count of obstruction of an official proceeding, five counts of false statements and one count of witness tampering in special counsel Robert Mueller’s probe into possible collusion between Russia and the Trump campaign during the 2016 presidential election. Earlier in the day, White House press secretary Sarah Sanders offered the White House’s initial comment on Stone’s indictment by seeking to distance the president from the matter. Stone, who has previously taken credit for persuading Trump to get into politics in the first place, served for a time as an adviser to Trump’s presidential campaign but left in 2015 amid controversy. In December, Trump offered praise for Stone after he vowed his loyalty to the president in an interview with ABC Chief Anchor George Stephanopoulos. “There's no circumstance under which I would testify against the President because I'd have to bear false witness against him. I'd have to make things up and I’m not going to do that,” Stone told Stephanopoulos on ABC's "This Week." (ABC News) Roger Stone speaks outside the U.S. Federal Building and Courthouse in Fort Lauderdale, Fla., Jan. 25, 2019. 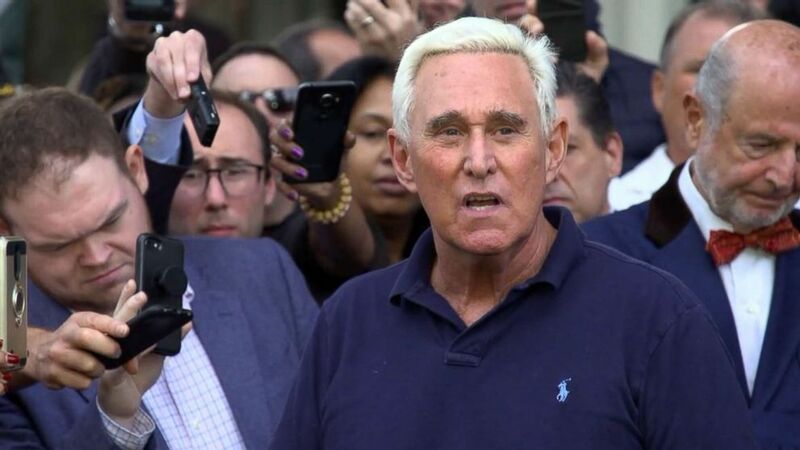 Stone repeated that claim in a news conference Friday, saying, "There is no circumstance under which I will bear false witness against the president." "I have made it clear: I will not testify against the president," he repeated for emphasis. "I intend to tell the truth. I am one of his oldest friends." Stone is just the latest in a series of individuals indicted by special counsel Robert Mueller, whose team of investigators has now indicted 33 individuals and three Russian businesses on charges ranging from computer hacking to conspiracy and financial crimes. Mueller’s team has been investigating whether there was collusion between the Trump campaign and Russia and potential obstruction of justice over the course of the nearly two-year long investigation. ABC News' Ali Dukakis contributed reporting.